We had 75 qualified entries in our 2016 Foal Photo Contest. There were 16 different breeds, several double-registered foals, 2 wild Mustang foals and a Zebra (yes, a WILD Zebra foal). Entries came from 17 states, plus Canada, Australia, and Zimbabwe. And, 365 people visited our website to vote. ﻿﻿Thank you to those of you who participated in our survey - the results are in! Equine legal contracts available online with instant download in PDF format. Purchase once and use as many times as you'd like. We have a full suite of equine contracts to meet your needs. Whether you are buying, selling, breeding, boarding, teaching, training, partnering or trading, we are your source for horse-related legal forms. Involved in a legal dispute? Our attorney represents clients in litigation cases in the states of California, New York, Washington and Oregon. The first step in hiring us is a consultation to go over your legal matter to determine the best way to help resolve your issue. See our Attorney Directory listings if you are not in one of these states. 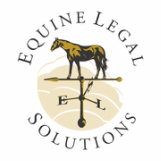 For our clients located in Washington, Oregon, California and New York, Equine Legal Solutions provides services to help you prevent legal issues through our custom contracts, incorporation and LLC formation, and expert equine legal business services and representation. These services are available only in Washington, Oregon, California and New York. If you have an issue with a national equine organization (such as; USEF, USDF, AQHA, AHA, APHA, breed associations/registries, etc. ), we can help you regardless of your state of residence. The first step in hiring us is a consultation to determine the best way to help your resolve your issue. Phone consultation fee: $175 for a 30-minute consultation. Consultations for legal issues are available to residents of, or matters involving, Washington, Oregon, California and New York. Consultations for matters involving national equine organizations (such as USEF and USDF) or national breed associations and registries (such as AQHA, AHA, APHA) are available for ALL residents regardless of state of residence. 30-minute initial phone consultations are $175; consultations are scheduled Monday through Friday at 1:00pm and 1:30pm Pacific Time. If you do not qualify for a consultation, please see our Attorney Directory for links to ​attorney directory in your state.